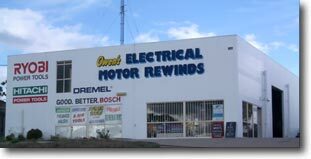 Owen's Electric Motor Rewinds Gympie - provide a full workshop service for all makes and models of motors. Owens Electric Motor Rewinds can provide a full workshop service for all makes and models of motors. Our workshop can provide service from minor repairs through to complete rewinds. Experienced tradesmen have the ability to assess and respond to urgent breakdowns promptly. At Owens Electric Motor Rewinds we are able to rewind or replace small household motors right through to large industrial installations. As well as a large stock of new motors, at Owens Electric Motor Rewinds we also carry a comprehensive range of Hitachi Power and Pneumatic tools, Welders, Air Compressors, Portable Generators, and accessories. We have competitive pricing on all our items and have the ability to get the right tool for the job. Whether you need to have your electrical power equipment serviced or replaced, contact Jeff at Owen’s Electric Motor Rewinds.